Here’s the repeated phrase I heard all summer and again this morning: “I’m 100 percent excited and one percent scared. What if nobody likes me?” My soon-to-be kindergarten daughter said this with a painful wince, like she’d just been bitten by a nervous bug. Like mother like daughter. I’m four decades in, and I still can’t escape the little school girl within. While school starts back this week, I just returned from back-to-back weekends at writers’ and speakers’ conferences, where I too felt like the new kid on the block. Toting notebooks, fresh packs of pens, and pockets full of nervous butterflies. Hustling and bustling among 800 other girls, I mean, women. Taking in the sounds of heels clicking through lobbies, constant chatter, and the sound of me exhaling and sinking into well-worn chairs. Although there were countless God conversations that melted my heart and lit up my confidence, there was that one that didn’t. Why, oh why, do I glide by the positives that were plenty, but stop at the one that was negative? Here’s the flashback. I loaded up at the breakfast buffet, scanned the cafeteria for a loner, and then made my way through the maze of women. Carrying my tray—and the familiar thought—I’m 100 percent excited and one percent scared. What if nobody likes me? “Oh, OK,” I stammered as I painted on a smile. And I’d love to tell you I brushed it off, went and gobbled down my food, and happily greeted the day. But I didn’t. I walked around the corner, left my tray and my confidence behind, and then hightailed it up to my room to sink into my chair of silly school-girl rejection. I know. I know. It wasn’t her. She was still nice as can be—it was just me. When you’re filled with nervousness and insecurity, and even if that seat is taken, just SIT IN MY LOVE. So that’s what I’m telling both my girls on the first day of school. Just sit in God’s love. And be on the look-out for the lonely and the timid, and especially those who look like they’ve got nervous butterflies swirling in their tummies. Then you hightail it over to them and offer a seat right beside you. There you have it. 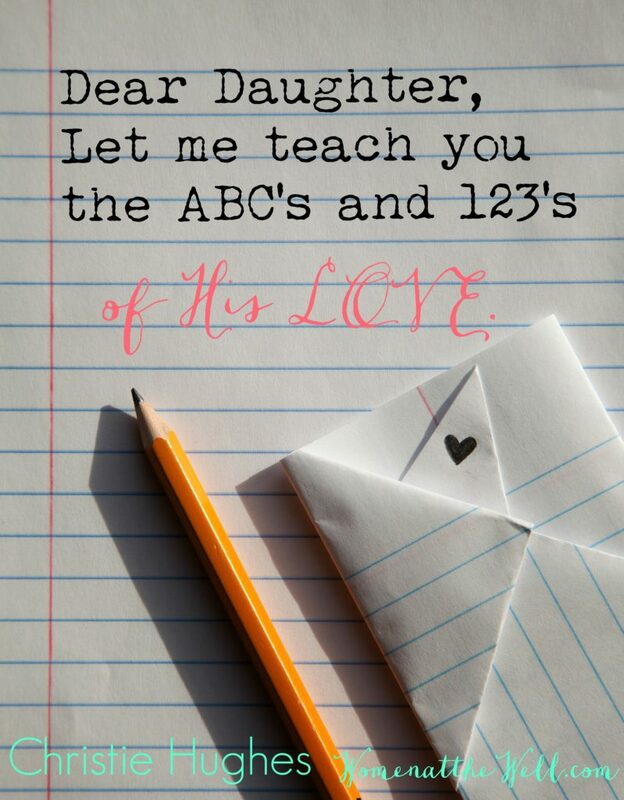 The simple ABC’s and 123’s of God’s love. And they are for ALL of us daughters. I’m so grateful that whether we’re five or ninety-five, we’re never too old to be taught like a child or too young to receive wisdom from the Teacher. And thank YOU for allowing me to sit and learn beside you as we share His sweet words of love here at our table. Feel free to share any of YOUR school-girl moments with me. And if you haven’t already, subscribe to the Well and go share our site with a friend. Whether it’s a round table or a circle of women, we are all to be a welcoming Well—where faith is better shared. I’m a mama. A lot of a days I’m a mess of a mama. I’m a daughter. Kind of messy there too. But I have a Heavenly Father who thinks that I’m to die for. I’m a wife. Married to my best-friend and my 6th grade crush. I saved him for last, though most days he puts me first. I’m one blessed mess. I like to write. Why do I write? Kind of hard to say, but I’ll go straight from the hard part and hit straight to the heart part. It’s about that daughter part. What this daughter misses most about her mama are the encouraging words. So I’m just here leaving a legacy of love and words to mine. For them, for me, and for anyone else who could use the same. Sitting at the well. As I simply write out life and fight out fears in the light of His Word.